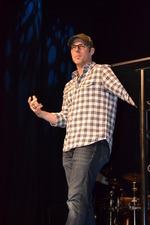 David Akers, a 17-year veteran of the National Football League, shared his story of faith at the Willowdale Chapel on March 27. On the evening of March 27, more than 250 men of all ages filed into the Willowdale Chapel in Unionville to the hear the story of someone they often prayed for during his 12-year career as the kicker for the Philadelphia Eagles, especially at moments when the entire outcome of a game rested on his left foot. But over the course of the evening, those in attendance realized that David Akers was actually praying for them. Sponsored by the Willowdale Men's Ministry, Akers' address encouraged men to examine their lives by strengthening their ability to persevere, to gain a stronger perspective and to surround themselves with people who can provide love, guidance and friendship. These are the fundamental edicts Akers shares with audiences around the country, as part of his David Akers Ministries. Akers spent the 2013 season with the Detroit Lions, and is now an unrestricted free agent. Rather than illuminate the many highs he has experienced in his football life, which have been been highlighted by two Super Bowl appearances and six Pro Bowl selections, Akers took the audience through the peaks-and-valleys journey of his 17-year career as a kicker in the National Football League which, he shared, have been dotted with failures. As an undrafted kicker out of the University of Louisville, Akers entered the NFL as a free agent, and was eventually cut by the Carolina Panthers and the Atlanta Falcons. He signed with the Washington Redskins and was activated, only to be cut the following day after a premiere that featured several missed field goals. lows of his career, one that was played out before a crowd of 75,000 at Giants Stadium and in front of millions of Eagles fans watching the game on television. 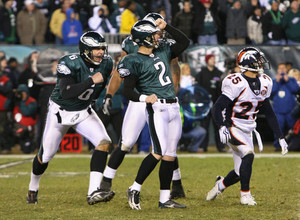 During the last regular season game of the 2002 season, and with seconds remaining in regulation and the game tied, Akers missed a 35-yard field goal attempt against the Giants, who went onto win the game in overtime. The missed kick had great impact, not only on the Eagles, who had just lost their home-field advantage in the playoffs, but also on Akers who, if the kick had been made, would have had the best field goal percentage of any kicker in the NFL and the most field goals in the league. On the two-hour bus ride home to Philadelphia, Akers inwardly fumed, but when he got home to his wife and newborn son, his perspective changed, as did his approach to perseverance. By shifting our perspective on how we look at life, we are able to understand that although the world says that we are losing, we know that we are winning, he said. By 2009, Akers said that he and his wife had been saved enough money to afford a dream home in North Carolina. Life was perfect at the time; Akers was now an All-Pro kicker in the NFL, he was the father of three children, and he was ready to write a check for ten percent of his salary that would help needy families in the community. Then he received a phone call from the Federal Bureau of Investigation. All of the money he had invested had been lost in a ponzi-type scheme. In football, Akers said that having strong personnel has enabled him to do his job. Using Proverb 27:17 – “As iron sharpens iron, so does a friend sharpen a friend” – as an example, Akers stressed how important it is for men to surround themselves with friends and family who can help mold them. Akers recalled a letter he received by then University of Kentucky coach Bill Curry, which was sent to Akers days after the young kicker missed two short field goals in a game that pitted rivals Louisville and Kentucky, which Louisville lost by six points. “Coach Curry wrote a handwritten letter, letting me know that I meant something to him, and that I needed to keep my chin up, and that I will have a lot more kicking in my future, and that no matter what I do on the field, I will have success off the field,” he said. “There are people in your life who help you, pick you up, and encourage you. Before Akers ended his talk with a prayer for those in attendance, he said that he would not be standing before them if he did not apply the components of perseverance, perspective and personnel into his own life. For more information about David Akers Ministries, visit www.davidakersministries.com. To learn more about the Willowdale Men's Ministry, e-mail Marc Lucenius at mlucenius@willowdalechapel.org.